VAN WERT – It was in the fall of 1959 when a fund-raising effort for the new County Hospital became the seed that eventually sprouted in the Van Wert Civic Theatre. The county history book published by the local historical society states that the at time the Twig Follies were being held to raise money for facilities at the new hospital. “As with most new undertakings, the early years were a struggle,” stated the history. “The group met in living rooms, store rooms and second floor lofts. But the response to live entertainment from the community was encouraging and in 1961 the theatre was invited to become a member pf the Van Wert County Fine Arts Association. “This important step forward provided a home at the Wassenberg Art Center with space available for meetings and rehearsal,” noted the history. For several years, productions were presented in the Junior Fair Building at the Van Wert County Fairgrounds. That all changed, however, in 1969, when the structure that had once been the old Catholic Church was purchased and renovated into the theatre. What remains as the current Civic Theatre was the second Catholic Church that had been constructed over the 1914-1915 period. The history states that bricks for the new structure were donated by the Ireton brothers, Ben, Will and Jim. On June 7, 1914, Bishop Schrembs of Toledo, officiated at the laying of the new cornerstone. The new church building was said to be built substantially and tastefully and was completed in October of 1915. Once again, Bishop Schrembs returned from Toledo, this time for the dedication of the new structure. 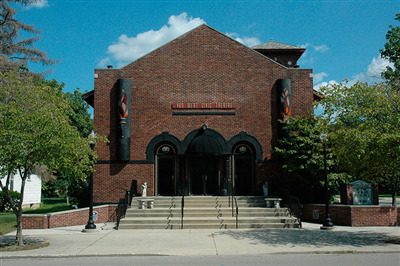 The theatre is a member of the “Ohio Community Theatre Association” and has won various state awards over the years. On Saturday, April 6 the Civic Theatre will celebrate their 60th anniversary with a Gala at the Wassenberg Art Center.